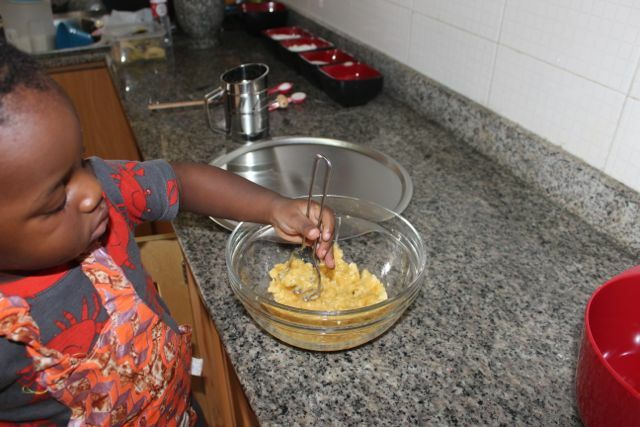 I think it is so important to spend time with children in the kitchen. There are so many incredible benefits. 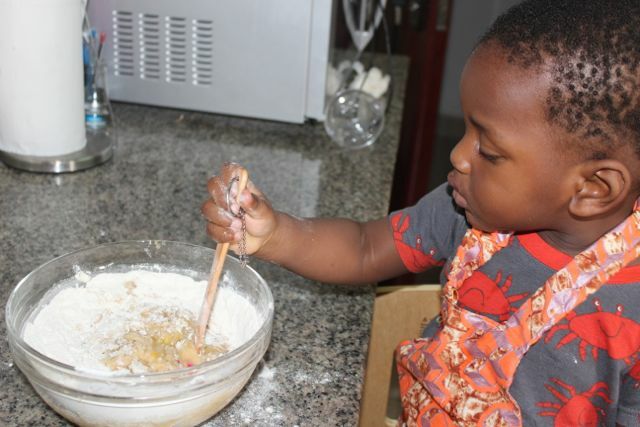 They have an opportunity to acquire new vocabulary, gain concrete knowledge of mathematics, experience so much sensorially and they off course learn how to cook. An important skill for independence and sustenance. 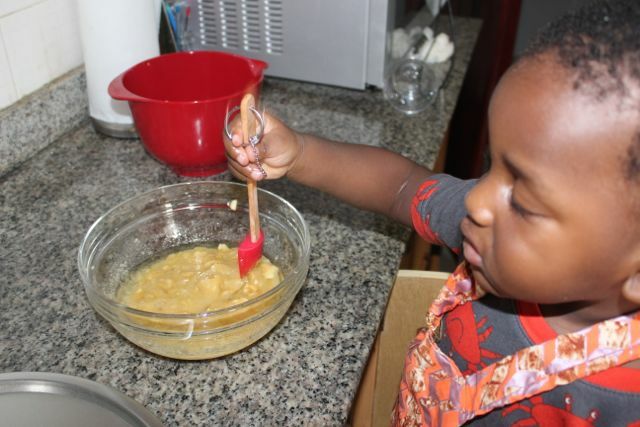 My son has been spending time in the kitchen with me since he was born. First in a carrier, and then sitting on the floor exploring with his eyes and his hands. 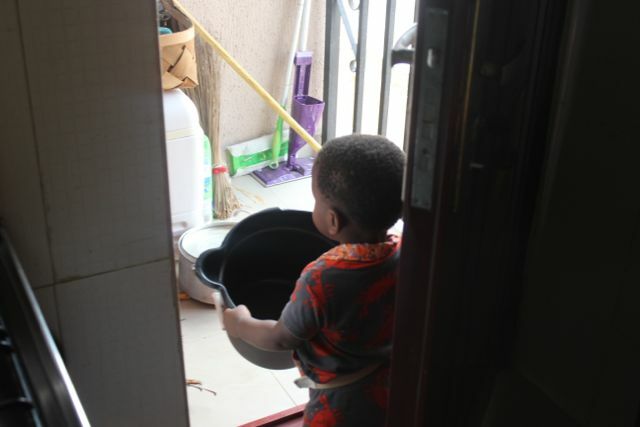 Once he started crawling, pulling up and cruising, he could explore the drawers and cupboards and even “do dishes“. 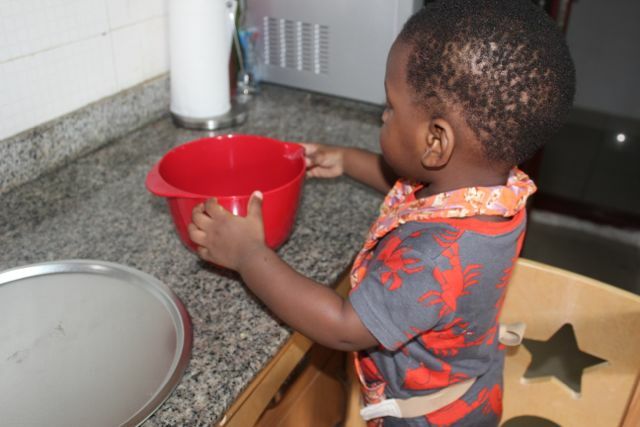 Now that his is able to, he actually participates in food preparation. 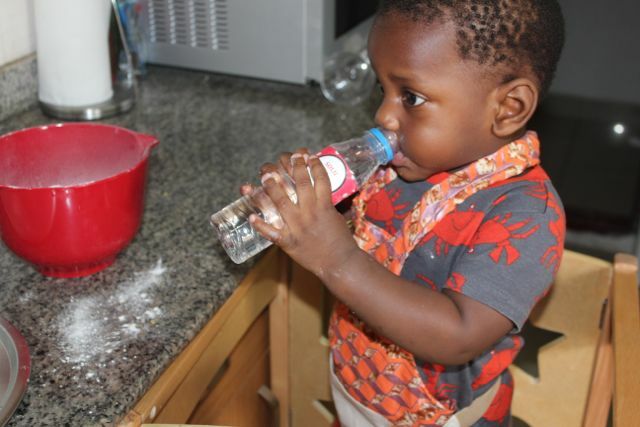 We have also made play dough before and today we tried baking! I received this recipe a while ago from my Instagram friend @starrhillgirl. I hesitated to try it because he seemed to hate bananas. 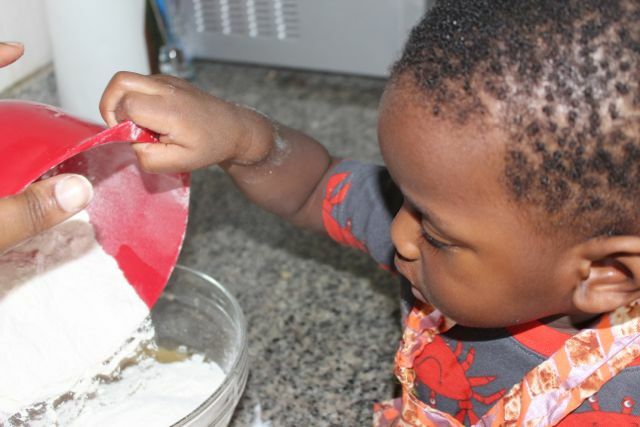 As children do, he recently made a 360 turn and they are his favorites so I wanted to make these cookies before he changed his mind again. 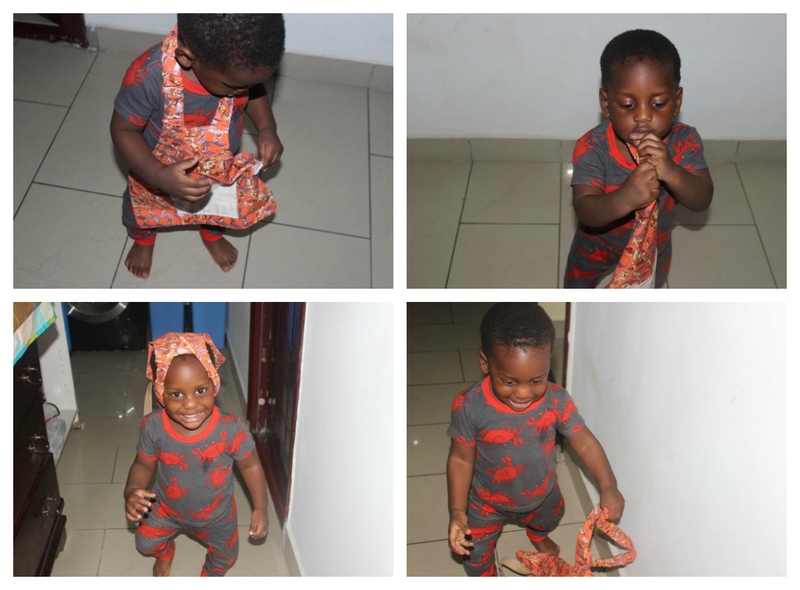 So here goes… for reference, he is 12 months old. *See full recipe at the end. 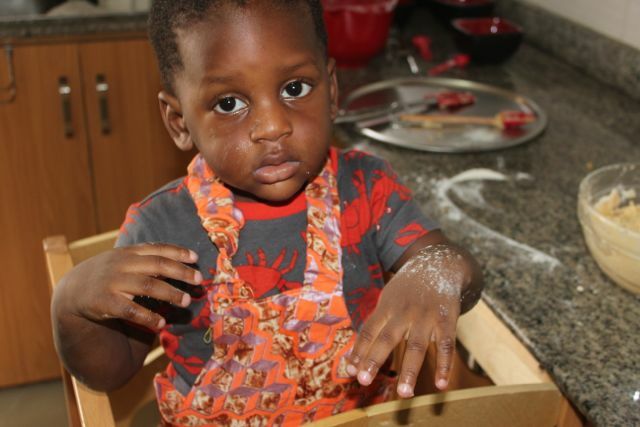 We washed our hands, put on our apron and I helped him get into the kitchen helper and it was time to bake! 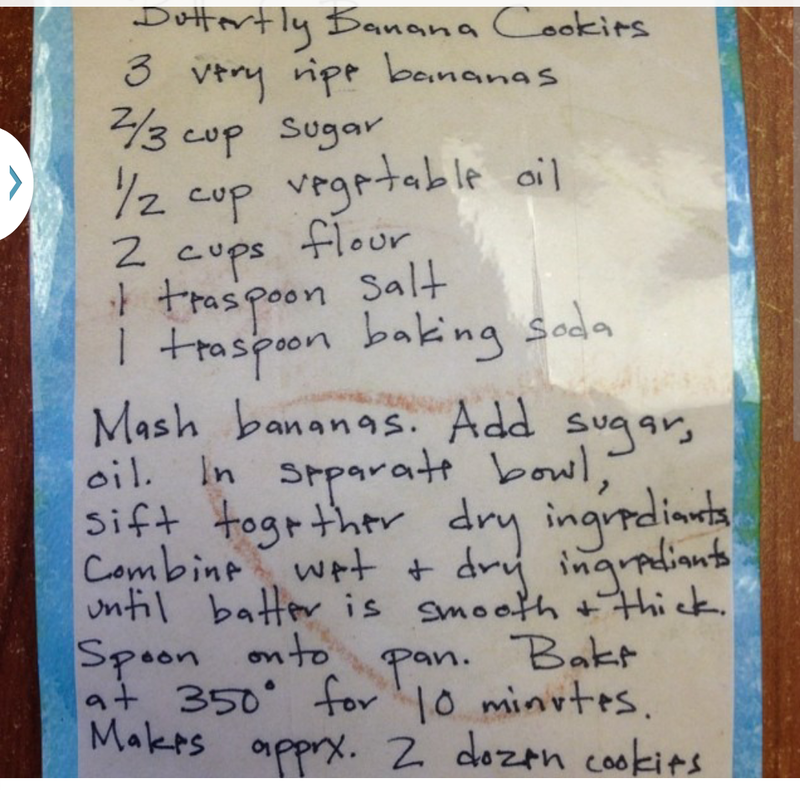 Ingredients: 3 very ripe bananas, 2 cups of flour, 2/3 cups of sugar, 1/2 cup of vegetable oil, 1 teaspoon of salt and 1 teaspoon of baking soda. 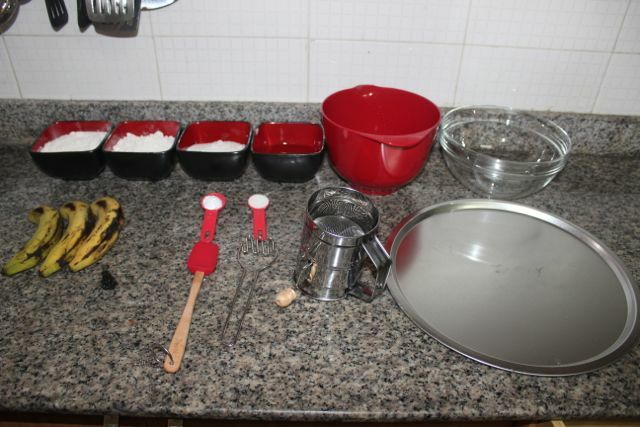 Utensils: 2 bowls, a baking tray/pan, a floor sifter, a masher, a mixing spoon (a wooden one is more effective) and a spoon – not pictured (for scooping the batter onto the tray). First look at the banana, say the name several times. 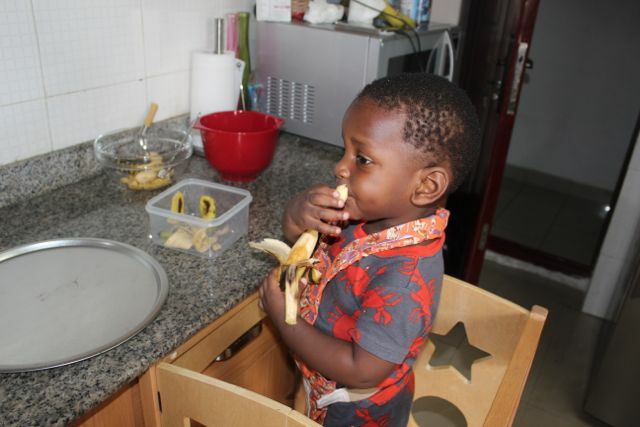 Feel free to smell it and even taste the unpeeled banana… we did! Next, peel the banana. He put the peel into the mixing bowl which reminded me that we needed another container for the peels. Add that to your list! We peeled and then mashed one banana at a time. I had a small masher for him and a regular one for myself. I showed him how to mash and then let him go at it. 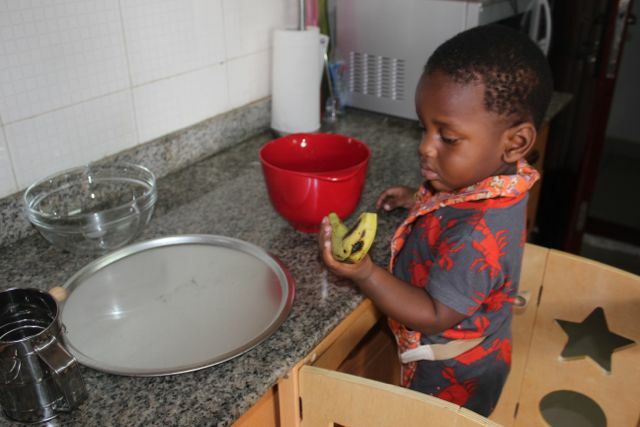 After mashing each banana, I would move the bowl away, bring a new banana and the bowl for the peels. You knew he was eventually going to taste it right? More mashing. I am still trying to figure out if he is left or right-handed. He switches all the time. By the way, I love how serious and focused he was on the process. He put hand in at this point. Did not really like the feel so I wiped his hand. Move the first bowl away and bring the second bowl closer. 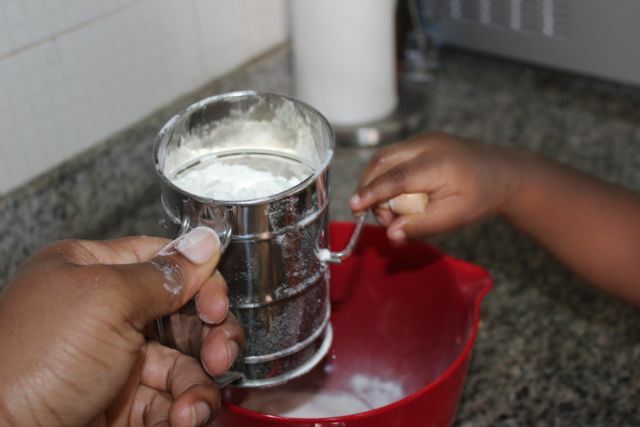 Using your sifter, sift the dry ingredients (flour, salt and baking soda). 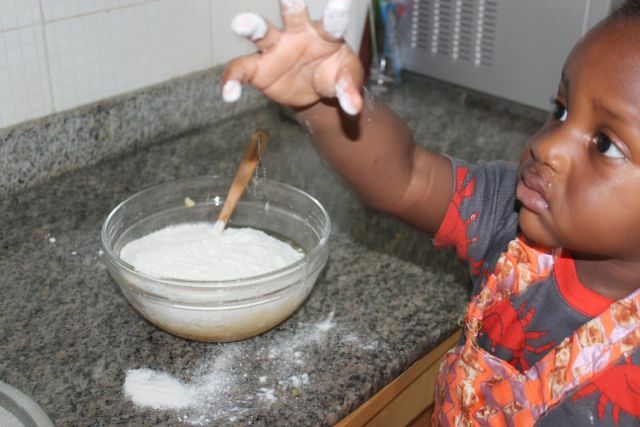 Turning the sifter was hard for him but he definitely tried. I let him go at it for a little bit then i had him hold the sifter (with my support) while I turned. I was surprised that he had lasted so long. 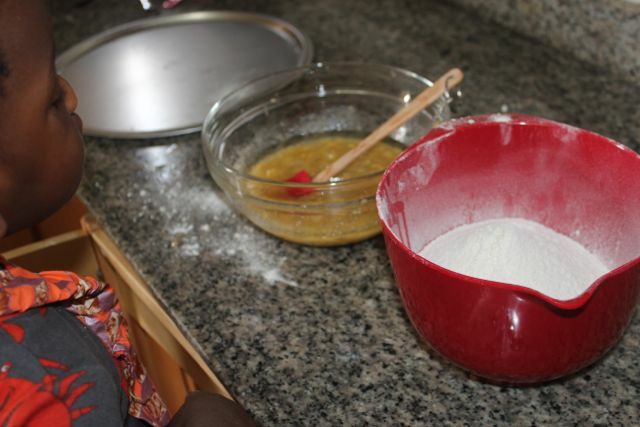 We poured the dry ingredients into the wet ones. Again I love his face in these pictures! and then decided he was done! lol. He said and signed done. It was perfect timing actually. and then put it in the oven at 180C for 10 minutes. 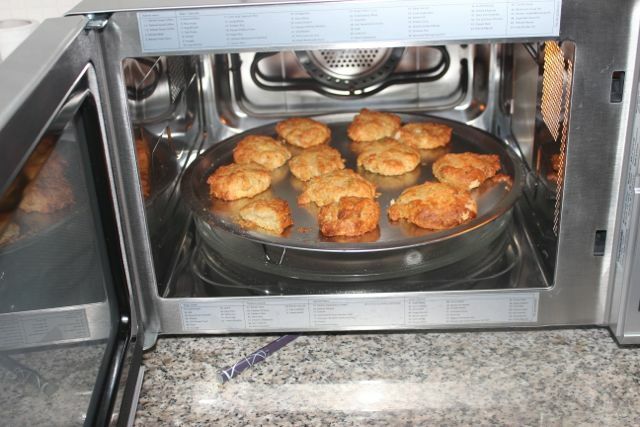 I used the convection setting on our microwave. He loved watching it. And then it was ready! Enjoying the cookie for his morning snack. 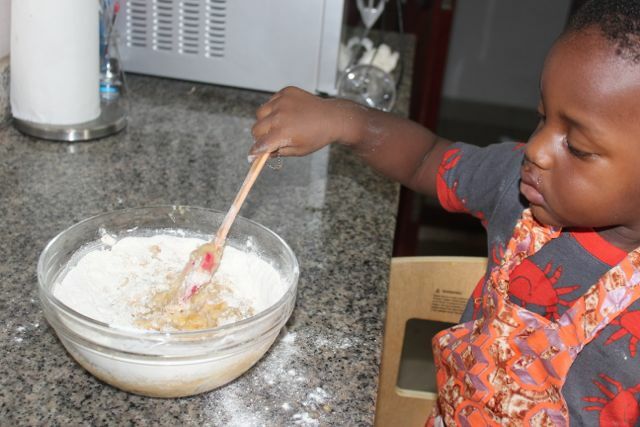 I don’t know if he remembered it from when we baked it earlier but it made mama happy to know he baked his first cookie! It was so amazing to see how focused he was on each step of the process. 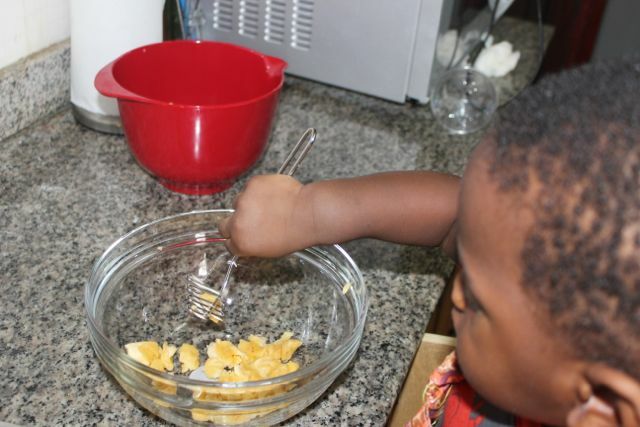 This is definitely another way that you can help your child develop the ability to concentrate. Here’s the recipe as I received it! Please let me know if you try it! Being able to go through these processes will be so beneficial for the future. I hope you try it! My only advice or key to success is having all the ingredients and utensils organized and ready before you start. 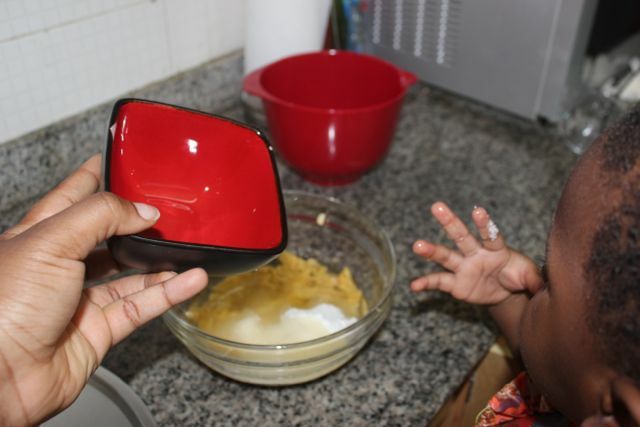 ETA: a fork or spoon can be used for mashing if you don’t have a masher and a sieve can be used in place of the sifter. 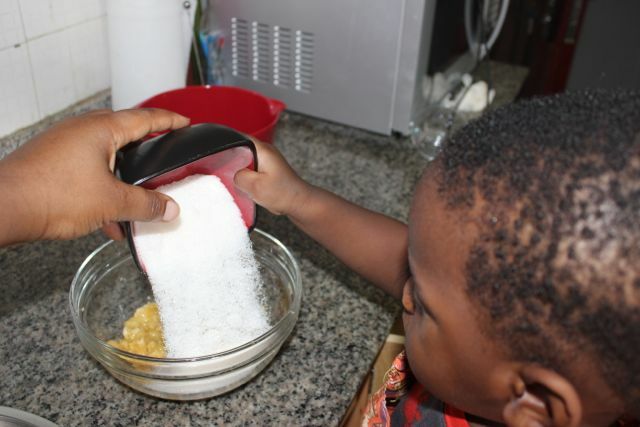 This is also a great recipe for children who don’t like getting their hands dirty. 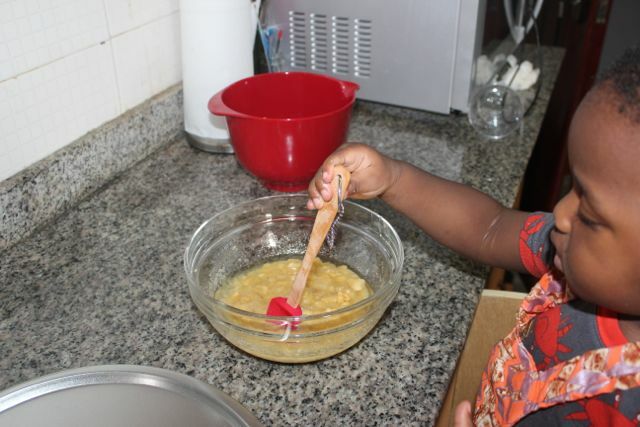 You can actually go through the entire process without touching any of the ingredients. 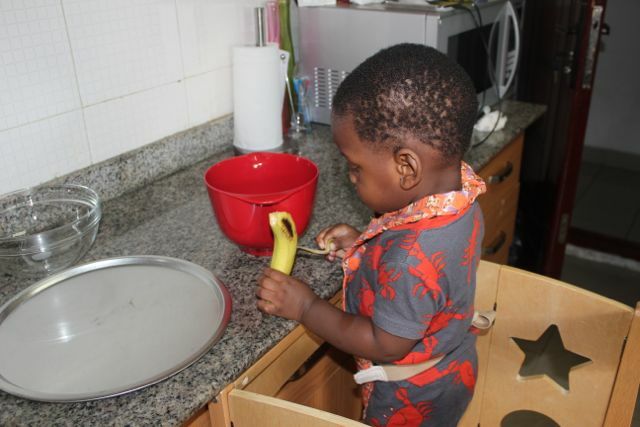 Well apart from peeling the banana, which can be done in advance. Wow this is amazing! Great job. I will teach this to my pupils in this age bracket. God will continue to increase and keep making you a source of encouragement to parents because that is what we need now for this world to be a better place. Thank you chikito. 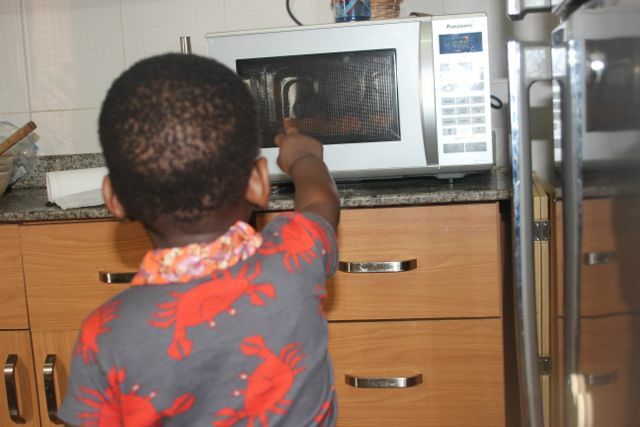 Our microwave is also an oven actually. 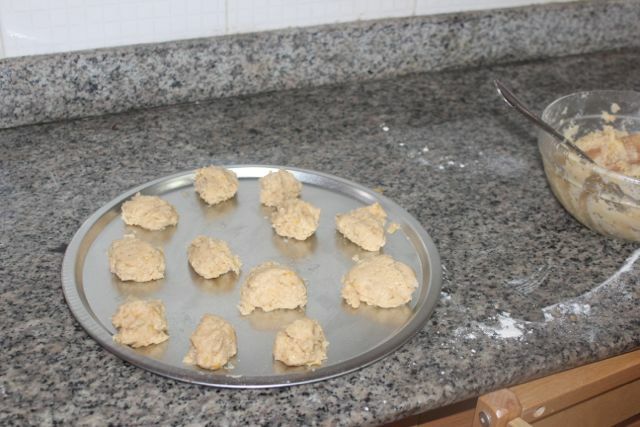 We chose it so we would be able to bake simple recipes like this. The process would be exactly the same with an oven. 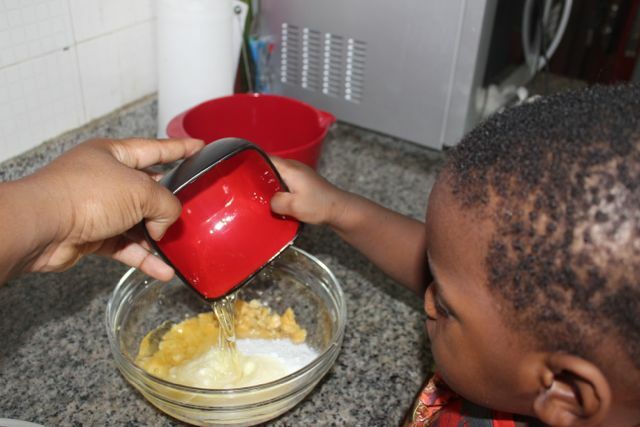 I also want montessori schools that don’t have a kitchen to know that they can still do baking exercises with the children using a table top convection oven. Thank you for your comment and do let me know if you try it! This is wonderful. Junny please keep it up. May God continue to give you the strength to go on and set a positive example to truly looking for ways to engage their children. Don’t lose your creative talent. He’s so clean! My little girl loves to get her hands in and squish. And she can’t help but bring the mixing spoon up for a taste and get her face covered in batter. The both of us, and the kitchen look quite spectacular once its all over. Thank you Junny. Lovely recipe. Lovely step by step photos. Much appreciated.